Regression of vertical velocity at 850 hpa against the NAO index. NAO associated upward mass fluxes are stronger in the high-resolution model resulting in intensification of precipitation. The study focused on evaluation and understanding of E3SM resolution impacts on the simulation of North Atlantic Oscillation (NAO) teleconnections to precipitation extremes. Extreme value analysis reveals that high-resolution (0.25º) E3SM v0.3 better simulates the impact of the NAO on precipitation extremes over parts of western Europe. NAO-dependent upward mass fluxes are stronger in the high-res model, intensifying precipitation. But, the high-res model simulates a weaker than observed impact of NAO on extra-tropical cyclone activity, underperforming the low-res model (1º). Simulated NAO impacts on precipitation extremes are generally improved with an increase in E3SM resolution. However, NAO associated large-scale drivers of these extremes are poorly reproduced. Alleviating these deficiencies could further improve teleconnections of large-scale climate variability modes. DOE scientists evaluated a high‐resolution (0.25°), four‐member ensemble simulation of the global climate (1979–2005) with the U.S. Department of Energy’s Energy Exascale Earth System Model (E3SM) v0.3—forced with observed ocean surface temperatures and sea ice extent—for its ability to represent the North Atlantic Oscillation (NAO) teleconnections to winter precipitation extremes over western Europe. 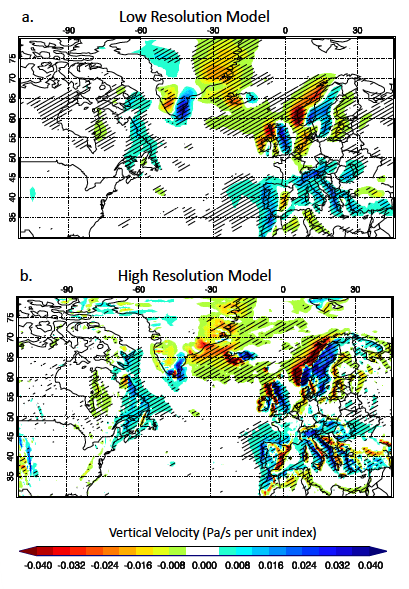 As compared to the low‐resolution model (1°), it simulates a stronger impact of NAO on daily precipitation extremes over the western slopes of mountain ranges over southwestern Norway, northwestern United Kingdom, and the Western Balkan states. Precipitation extremes and their linear relationship with NAO are quantified using the generalized extreme value distribution. NAO‐dependent large‐scale (stratiform) precipitation intensity strengthens in the high‐resolution model on seasonal time scales and plays a dominant role during simulated daily precipitation extremes. Improvements in the high‐resolution model over these varied‐topography regions largely appear to be due to finer resolved scales of motion that amplify NAO‐dependent seasonal vertical moisture fluxes and enhance stable condensation. However, the high‐resolution model simulates a weaker than observed impact of NAO on extratropical cyclone activity and total precipitable water, generally underperforming the low‐resolution model. These effects possibly offset the impact of enhanced vertical moisture fluxes on NAO‐dependent precipitation extremes in the high‐resolution model in these regions. Over the southwestern Iberian peninsula, the high‐resolution model underperforms the low‐resolution model simulating weaker than observed impact of NAO on precipitation extremes. This appears to be due to the reduction in total precipitable water despite an increase in NAO‐dependent extratropical activity there.